Author: Michael Bareford and Philippa Browning are from the Jodrell Bank Centre for Astrophysics, University of Manchester and Ronald Van der Linden is from the Royal Observatory of Belgium. The million-degree temperatures observed in the outer atmosphere of the Sun are considerably hotter than that of the photosphere (T ≈ 5800 K). A possible candidate for the heat input required to sustain coronal temperatures is the kinetic energy of the convective motions that continually occur at and below the solar surface. Figure 1: EUV emission from the coronal loops above an active region on the solar limb. 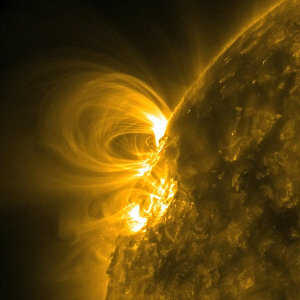 Courtesy of SDO (NASA) and the AIA consortium. Magnetic fields are buffeted by these turbulent flows and so the kinetic energy can be transmitted to the atmosphere, since the same fields permeate the corona. Coronal loops are closed magnetic fields (Fig. 1) which intersect the photosphere at two footpoints. The convection-driven flows near the footpoints perturb and cause restructuring of the coronal field. Crucially, the time-scales for convection (hours) are much longer than those of the magnetic perturbations that they drive (seconds). Therefore a loop has time to settle to a new equilibrium before it receives further energy and magnetic energy is stored within the loop. It is often suggested that coronal heating might be the combined effect of a series of discrete events – heating is therefore episodic rather than steady. We have developed a new model of coronal heating which predicts episodic heating and quantifies the distribution of heating events. Driven by photospheric turbulence, a loop may acquire sufficient magnetic twist to become unstable. When this happens, the magnetic field transitions rapidly to a state of lower energy. The energy is dissipated by fast magnetic reconnection in current sheets, which arise as the unstable field is strongly disrupted. Our model predicts the energy distribution of heating-events, and also their time sequence. The former can be tested against coronal heating requirements, whereas the latter can be more directly compared with observations. Due to slow photospheric driving, the coronal field evolves through a series of nonlinear force-free equilibria, described by ∇×B = α(r)B, where α=(μ0 j⋅B) ⁄ (|B|2) is the ratio of current density to magnetic field. We model this with an α-profile for an idealised cylindrical loop with a constant α1 in the core, α2 in the outer layer and α3 in a current-neutralisation layer (Fig. 2, right). The loop is embedded in a purely axial potential field and carries zero net current (determined by α3) so that the azimuthal field is zero at the loop edge. The photospheric twisting is localised within the loop, while its surroundings are unchanging. Our approach is based on the ideal kink instability, as shown in Fig. 2 (left). Figure 2: On the left, an idealised loop undergoes a kink instability in response to a photospheric flow (red arrow) - the effect has been exaggerated for clarity. The black arrows represent magnetic field lines. On the right, the loop cross section with a piecewise-constant α-profile. When the loop kinks, the field on the inside of the kink is greater than that on the outside. The increased magnetic pressure on the inside of the kink causes the imbalance to reinforce itself and continue to grow, if the field is sufficiently twisted. We use a linear MHD stability code [2, 3] to uncover the values of α1 and α2 for which the kink instability does not grow, identifying all the possible stable equilibria. The loop evolves between these equilibria, in response to photospheric driving but ultimately a threshold is crossed, heralding the onset of the kink instability. The instability soon becomes nonlinear and magnetic energy is rapidly dissipated via magnetic reconnection [5, 6]. We use a 3D numerical MHD code  to simulate this process (Fig. 3). Areas of reconnection and heating (via Ohmic dissipation) are shown in red, where magnetic diffusion can occur in thin current sheets, despite a near ideal environment. A heating event like this represents an individual small flare, such as a microflare. It is not practical to run a simulation for every point on the instability threshold, so instead we use the theory of Taylor relaxation  – first used for laboratory plasmas – to identify the post-flare configuration. The Taylor relaxation theorem says that, under conditions relevant for the loops simulated here, the minimum energy state has constant α throughout the loop volume. When a loop reaches an instability threshold it evolves towards a state that has the same helicity and where α1=α2. The energy released during this transition is simply the difference in energies between the threshold state and the relaxed state. A distribution of energy releases (Fig. 4) is built up from the crossings of the instability threshold as a loop is driven randomly by photospheric perturbations [2, 3]. The path to instability comprises equal steps in α, either with an entirely random direction or with a correlated one. The higher the correlation, the more tightly the walk hugs the α1=α2 line and the narrower the range of threshold crossings. For this reason, the correlated distributions in Fig. 4 are Gaussian shaped, whereas the uncorrelated ones are much broader. It is very significant that the latter follow power laws with gradients approximately equal to -2, giving a prediction of a nanoflare distribution consistent with coronal heating requirements. Figure 4: Flare energy distributions for a 105 loop ensemble, with each loop undergoing one relaxation event involving a 50% increase in radius. The distributions are generated from uncorrelated (left) and correlated (right) walks. Aspect ratio is indicated by colour (L ⁄ R = 10 is blue, 20 is black and 30 is red). 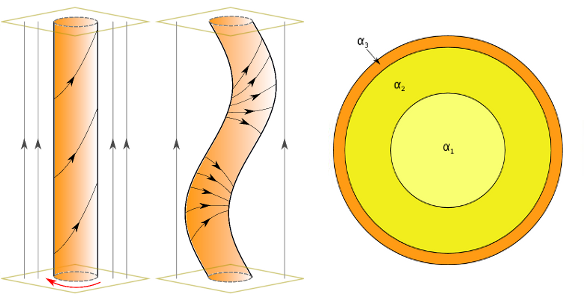 A flare distribution is dependent on: the ratio of loop length to loop radius; the spatial correlation of the twisting motions; and the amount of radial expansion that occurs during relaxation. Numerical simulations indicate that the loop expands somewhat as it relaxes, owing to reconnection with the surrounding axial field ; for the results shown here, we take the radius of the relaxed loop to be 150% of the initial radius. The total energy fluxes calculated from the distributions agree with coronal heating requirements, whether or not the driving is correlated . With a coronal loop radius of 1 Mm and mean coronal |Bz| of 100 G, we obtain the following energy fluxes, 0.7-1.0 × 107 erg cm-2 s-1 – the results for uncorrelated walks fall in the lower half of this range. Also, for the aspect ratios considered, we find no dependence between loop length and energy flux. We also present the energy-release sequences (Fig. 5) associated with a patch of solar surface that hosts a single evolving coronal loop. After each energy release it is assumed that the loop disappears. Subsequently, a new loop appears with a randomly-chosen stable configuration and embarks on an uncorrelated walk. Or, it appears with a stable configuration that is close to the potential state (α1=α2=0) and begins a correlated walk. Figure 5: Synthetic flare-energy sequences derived from a series of loops that appear, one at a time, within a notional section of photosphere. The sequences are generated from uncorrelated (left) and correlated (right) walks. All loops have the same aspect ratio (L ⁄ R = 30). The flare energies have been dimensionalised as indicated above and the times have been derived  assuming photospheric twisting motions of vθ = 1 km s-1. Correlated driving causes the range of energy releases to narrow and the absence of lower energy flares reduces the event density. It will be very interesting to compare the energy-release sequences with observations, though we do also have to account for a range of loop parameters and loop cooling. We also intend to simulate the effects of photospheric driving, exploring the relationship between the speed of the photospheric motions and the size of the energy release, as well as determining the consequences of maintaining the driving during (and after) relaxation.